Because Lena Dunham still lives in Brooklyn Heights, we are legally obligated to cover Girls-related topics. 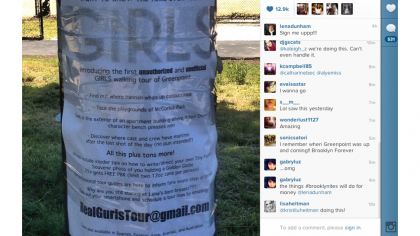 According to Jezebel, there is now an unofficial Girls tour taking place throughout Greenpoint. Whether this stop ends with a visit to Lena Dunham’s house here though, is anyone’s guess. BTW—does Lena Dunham still live here? I haven’t ever seen her, not that that means much. Anyway, if you want to “Gawk at the exterior of an apartment building where Adam Driver’s character bench presses iron,” email RealGurlsTour@gmail.com. Bank Robbery At Brooklyn Heights’ Sovereign!